The U.S. Fed “quantitative tightening” program has had little negative effect on the domestic economy, so far. All U.S. stock indexes sit at or very near record highs. Some argue that the economy is running too hot. The latest jobs report showed steady wage increases, which helped ease Fed concerns about inflation (source CME Group). In spite of the Fed pushing interest rates steadily higher the EVRISI HOUSE Price Survey showed that home prices have remained remarkably steady. Mixed signals on inflation probably will not deter the Fed from raising rates in September. In fact, a CME survey shows a 93.6 % chance of a rate increase. 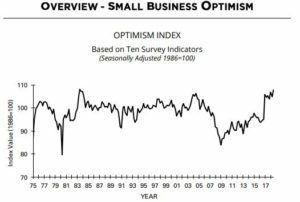 The NFIB survey of small business owners Optimism Index spiked higher after the election of Trump in November 2016 and this month tied the all-time record high made in 1983. Small business owners are important to the economic success of America. They create jobs, spend money on capital investments and develop innovative products that raise the standard of living. They are more likely to do these things when they feel confident. Trump may have become his own worst enemy. He harshly criticized the Fed Chair Janet Yellen for politicizing her position by keeping rates too low for way too long, printing money to fund Democrat entitlement programs, doubling the national debt and adding $4.5 Trillion to the Fed balance sheet. Trump brought in his own more hawkish Fed Board led by new Fed Chair Jerome Powell. This MOOCC board has been slowly raising rates in ¼ point increments. As discussed above, the economy is running hot. Perhaps too hot. In the last year through July the CPI increased 2.9%. The annual increase in the core CPI was +2.4%, the largest rise since September 2008 (Source: US Dept of Labor). With the U.S. raising rates, that is pushing the US$ higher against almost all other currencies. That makes U.S. goods and services expensive against the Chinese Yuan for example, at a time when Trump is trying to pressure China in his trade war. In an interview last week with Reuters and in numerous tweets Trump said, “I should be given some support by the Fed”. With this more hawkish and autonomous FOMC board, I would not expect him to get it. This would go under the category of ”be careful what you wish for”. This is a delicate “Goldilocks” economy that could turn into the big bad bear quickly. As with all my recent letters, I believe that you should stay in equities, but I strongly recommend lowering the risk to your portfolio with a judicious allotment to managed futures. 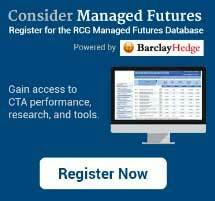 As always, an allocation to managed futures will not guarantee reduced risk or protect against futures losses. All smart investors hope for the best but prepare for the worst.